It’s been said: I’m a postmodernist. My theory of criticism as it pertains to the ongoing discussion is, people are comfortable reading things at a certain level of depth, and react to attempts to give them a different level with hostility: either you’re a moron for giving them too simple a review, or you’re a huge dork who obsesses too much over details. Is there a “solution” to this? Why, whoever said it was a problem? Obviously on some level it’s not ideal for people to have different tastes and hence differing conclusions: if the point of your reading an anime review is to find more anime that you will like, you ideally want reviewers to capture your tastes perfectly. But finding ten thousand otaku marching in goose-step makes for a very boring blogosphere. It is in debate, in trying to explain ourselves to others who do not share our views, that we reach beyond a superficial description of our likes and dislikes. We evolve when we are forced to. And therein lies the rub. What is the realm of ridiculousness? What is a ridiculous level of analysis for you is something that others may be perfectly comfortable with. Who are you, then, to say what they can or cannot think about? Certainly if I produce criticism, you are free to accept or reject it, and to tell me that you find it over-analytical or otherwise lacking. And certainly I may feel obligated to please my readers. But this is a slippery slope and ultimately, to take another term from his reviews, a “crapshoot:” Even if I have my mind set on pleasing readers, I may also receive comments from people praising my attention to detail. And even if comments unilaterally speak in one direction, there is hardly any guarantee that my attempts to ape some other standards that I am unfamiliar with will produce results pleasing to me, to the readers who complain, or to anyone. On some level, audience matters. I can have a discussion with Mike about the attributes of the Shekinah, and it will make sense to us and not be ridiculous. Yet if I attempt to have this very same discussion with another theoretical physicist, I risk being branded a loon or a religious nut. Is it wrong of Mike and I to engage in such a conversation? No. Is it wrong, then, of the physicist to look at me like I’m crazy if I bring it up with him? Not necessarily then, either: I would know what I was talking about, but I would also be acting in a grossly inappropriate fashion. The context involved is different. Our “problem” – if you wish to call hundreds of shut-ins discovering that other people who are just as passionate about anime as they are can and do have different tastes “a problem” – is that we have no cues for context. 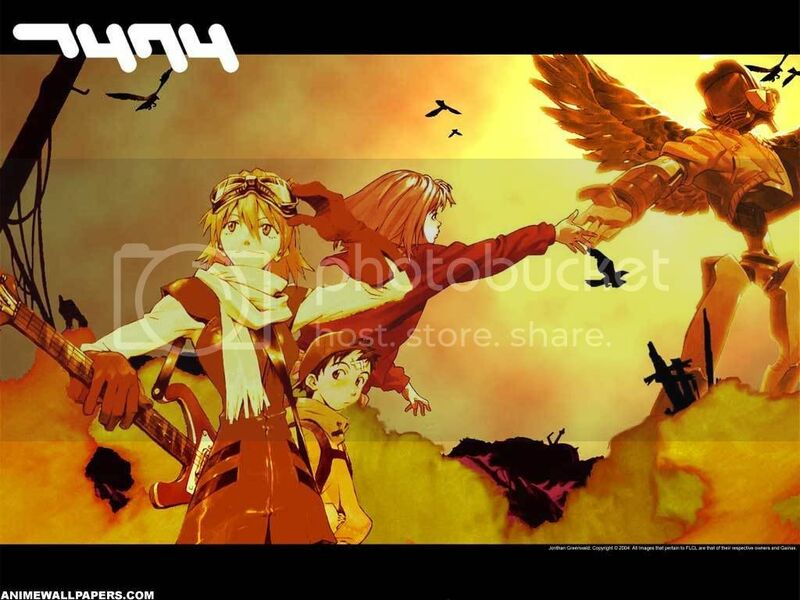 On some level, anime, like most forms of art, is experiential and deeply personal. How many years have religious believers argued over their personal experiences of the numinous? 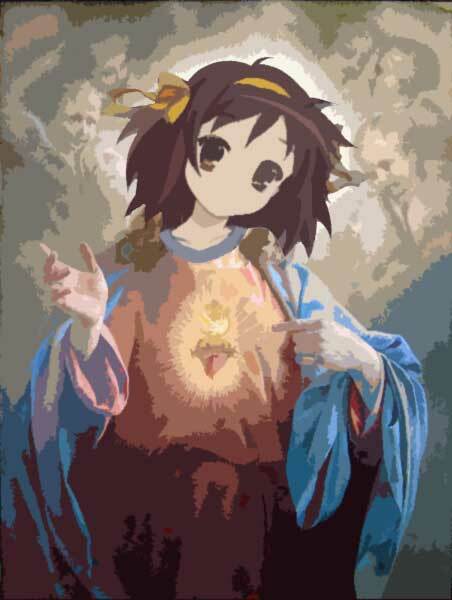 I will not argue that anime is a religion (Haruhiism aside), but the very same expectation exists: your wonderful experience must be my wonderful experience, or else. I’m pretty critical of that. —True. Basically, that’s just the thought about it. —Maybe. But I just oso (sometimes) hate mecha-nerds. No offense to such people if they ever read this. It’s just that, well… I’ll just shutup. 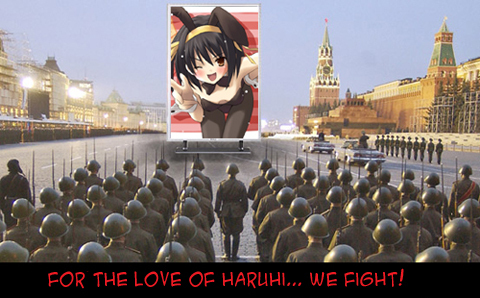 rollchan, I would not want to stop the Haruhiists. They don’t make the blogosphere boring either. IKnight, I’m flattered that you take an interest in my work. It’s true that I only have one Anime Diet review on file, but surely the four examples of past work linked to in my opening entry count for something. And of course I’ll have more articles as the days go by. As for this article, I don’t intend to state that criticism has one proper purpose, nor would I propose to defend such a viewpoint. My stance is more existential. It doesn’t really behoove you to comment: you could demonstrate your approach to criticism by practicing it. Anyway, I think you’re quite right that the audience matters, but I’m not sure I’ve grasped from this what you think the purpose of criticism is, and whether you’re discussing criticism that’s primarily aesthetic or primarily analytic. Audience definitely matters, but for the context at hand, I think that the right audience will find you. When I first started out, I wasn’t really sure what I wanted to do, and I wound up doing a lot of basic merchandise/life posts – it wasn’t until afterward that I started episodics, and it wasn’t until even later that I moved on to editorials. I’m sure that I lost a few readers along the way, but I’m equally certain that I gained a few. Conceptually, I find that this is a satisfactory reason at the broadest level as well as on the personal, practical level – it’s good to have a variety of views in reviews because otaku themselves have a variety of tastes. …Anyway, great article. I look forward to reading more of your work in the future, moritheil.